As a lady on a diet, I’m always on the hunt for a treat that doesn’t make my Jewish guilt it’s b-i-t-c-h. I want something that tastes good and feels indulgent while also keeping my capability for chub rub at bay. And this summer I thought I found it in frozen yogurt chain 16 Handles. It feels like as of late you can’t throw a medicine ball in Manhattan without hitting one of their neon-colored stores. I even spotted one in Astoria QUEENS yesterday, so you know they’re taking over. It’s an irresistible concept. Sixteen kinds of froyo that taste exactly like what they’re supposed to, every kind of topping under the sun, and a help yourself/pay by weight policy that gives you total control. You can swirl birthday cake/peanut butter/chocolate/coconut froyo and cover it in crushed snickers, cake crumbs, fruity pebbles and maybe some bananas and berries or something in one supposedly low-cal bundle. Problem is, it’s really freaking bad for you. 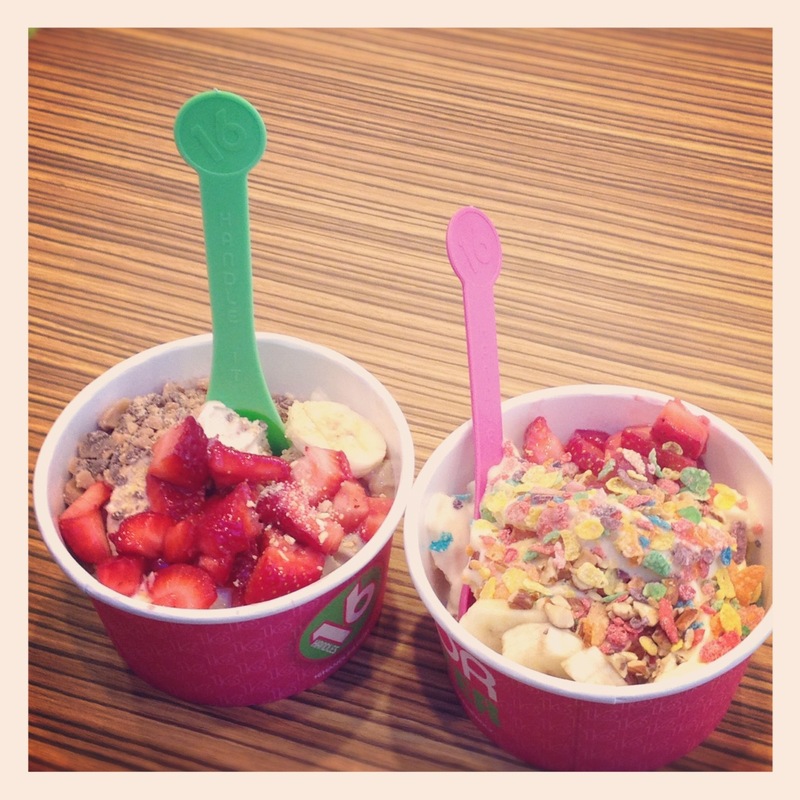 16 Handles doesn’t necessarily claim to be health food, but the words “non-fat” or “low-fat” are prominently displayed on all of their flavors, and yogurt culture is one of svelte-frames and knowing that there are types of broccoli. Also, since the method is self-service, it’s up to the customer to decide just how much goodness they want to shove down their gullet. That said, both the business and the customer are to blame here. On a recent late night 16 Handles run, which are admittedly becoming way too frequent in my life, I did the stupid thing of actually looking at the well-advertised facts of what I was eating. Each serving of the yogurt contains roughly110 calories (on average), however a serving size is only 1/4 cup. The cups provided are about 16 ounces (2 cups) so there is the first problem. Most people wanna fill that baby up for a whopping 880 calories, but I try and stop halfway, making the base alone about 440 calories. And that’s before you even add the toppings. Any dieter worth their lack of salt knows the caloric content of the toppings by eye. For any of the candy toppings like M & M’s, Snickers, peanut butter cups, etc. you do the math based on how much a “fun-sized” serving of those treats have. Going for the cookie/cake/cereal type items follows the same concept of figuring out the proportional serving, and then you can picture the sauce-type toppings (my favs are peanut butter and marshmallow) as liquid calories. Basically, stick with the fresh fruit or otherwise assume you’re adding at least 100-200 calories to however much yogurt you decided to indulge in. So my average 16 Handles treat potentially clocks in at a mortifying 600 calories. Gross. 600 calories is about half of my calories for the full day. It equals approximately a pick-up truck full of all vegetable salad, or a footlong turkey at Subway, or 2 donuts, or 6 veggie burgers. I can’t keep spending that much of my precious cals on something largely made of chemicals that is usually consumed as a snack. Game over. Sorry 16 Handles. You are delicious and a super fun thing to do with friends, but I’m gonna need to stay away until I can figure out how you work in my diet… Or when I gain some GD control over the hungry hungry hippo that lives inside me… Whichever comes first.